In 1996, we set out to make great games, but we knew back then that we had to first create a place that was designed to foster that greatness. A place where incredibly talented individuals are empowered to put their best work into the hands of millions of people, with very little in their way. This book is an abbreviated encapsulation of our guiding principles. 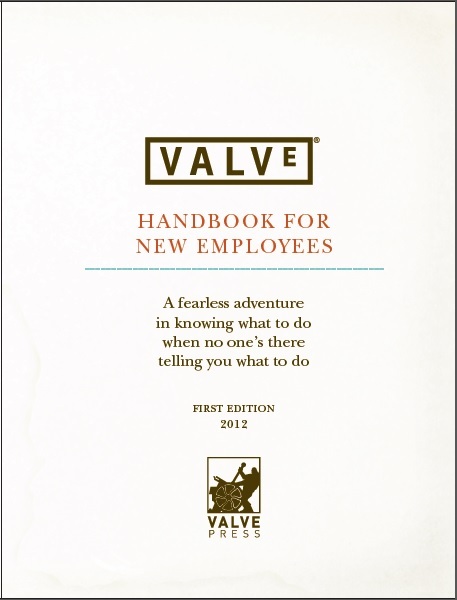 As Valve continues to grow, we hope that these principles will serve each new person joining our ranks. If you are new to Valve, welcome. Although the goals in this book are important, it’s really your ideas, talent, and energy that will keep Valve shining in the years ahead. Thanks for being here. Let’s make great things. Part 3: How Am I Doing?